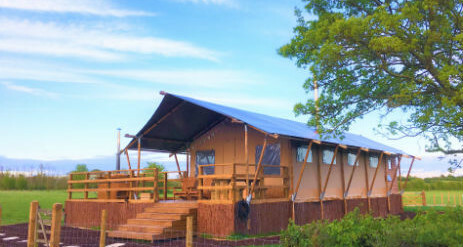 Re:treat is an exclusive private luxury safari lodge with its own wood-fired hot tub situated on a raised large timber deck. Re:treat overlooks a large pretty pond and meadow which is cut for hay. Re:treat has its own grassed area within a low level fence with access to the pond and meadow field being via a wooden gate. 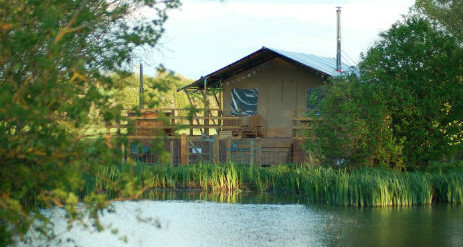 There’s plenty of space to kick back and relax with views of the pond and of stunning sunsets over the hills at night. Whether it’s relaxing on the pond side jetty or pond dipping (nets provided) the pond area is an enchanting place to while away time. 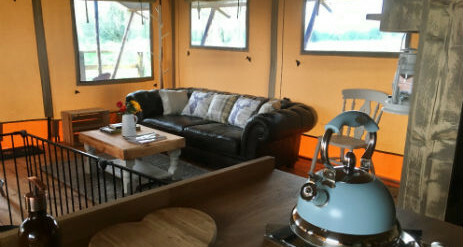 There’s also a small summerhouse complete with a rocking chair to take in the views of the pond and relax with a good book. 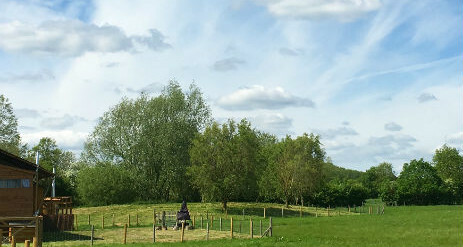 Walk across the ‘Meadow field’ and ‘Dewpond field’ at Re:treat to ‘the old orchard’. With mature trees around the perimeter of this grass meadow, this is a wonderful space for you to picnic, play and relax. Re:treat. There’s a great pub in each of the villages and each one is only a 25 minute walk away via the footpaths. Re:treat is the perfect setting to create some wonderful memories with companions and loved ones. The wooden hot tub is a fantastic way to relax….from watching the sun setting each evening or just having a relaxing daytime dip. There is also seating on the deck to take in the view of the pond and relax with friends and family. Homemade meals are available at Re:treat Prebook tasty dishes including beef stew and vibrant Thai curry which are freshly prepared ready for you to reheat on the stove. The tasty meal also comes with a homemade loaf of bread to mop up the yummy sauce! Vegetarian options are also available. We’ve tried to think of the things you will need to make planning for staying at Re:treat much simpler. 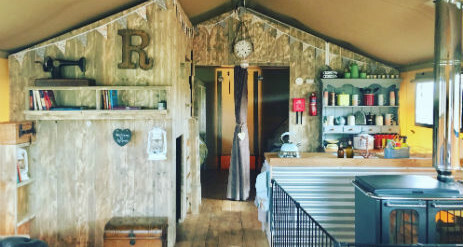 You’ll find all of the following included in your stay at Re:treat as standard; Beds made up on arrival, towels, paraben free UK made toiletries, an array of locally sourced fresh ground coffee, loose leaf teas and hot chocolate, basic kitchen provisions and toilet and kitchen roll. There is also an initial supply of wood provided for the hot tub and wood burner. A selection of toddler books, games, plates and cutlery can also be requested at no charge. 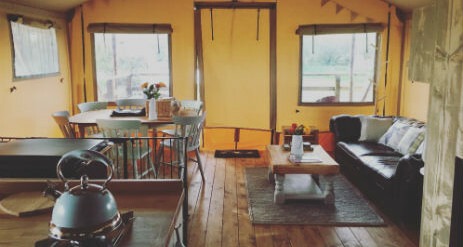 You also have the option to book some little extras ranging from firepit hire (including wood), reflexology treatments, locally sourced BBQ and breakfast packs (meat from award winning Woburn Country Foods), fishing and afternoon tea from local pop up vintage tea room ‘The Tea Cup Inn’. For the adventurous there is also a wide selection activity centres nearby ranging from indoor rock climbing, a snow dome (skiing, snowboarding and tobogganing), water park, canoe trails and outdoor climbing. For walkers and nature enthusiasts, Barton Hills National Nature Reserve is only 3 miles away from Re:treat. They are part of the Chilterns with hiking routes marked on maps at the entrance to the hills. The view at the top of the hills is fantastic. There is also a wide range of forest parks and walks to explore including Marston Forest Centre, Rushmere Woods and Ampthill park. There’s plenty nearby for little ones too ranging from indoor (Flitwick) and outdoor (Hitchin) swimming pools, Farm parks (Mead open farm & Standalone farm), a theme park (Gulliver’s land), Outdoor play (Knebworth house and dinosaur trail) and soft play options too. The historic market town of Ampthill is only a 15 minute drive away and has an eclectic array of quaint independent shops ranging from antiques through to upcycled furniture and specialist home and gift shops. There’s also a Waitrose for stocking up on provisions. It’s home to a wide range of fabulous tea rooms and a good selection of Gastro pubs and independent restaurants. As well as stocking a delicatessen and a great selection of what any cook could need ‘Cooks Collection’.